The tight fresh endives look like early spring magnolia buds right now, and I cannot get enough of them. They are always cradled in purple paper on the market tables, clean and white. Today, I chop them in staggering diagonals like my Ayi once showed me, just holding on to her in this way. There's no other reason. The angle of a knife. It's funny how a simple gesture can bring so many thoughts about a person to mind. 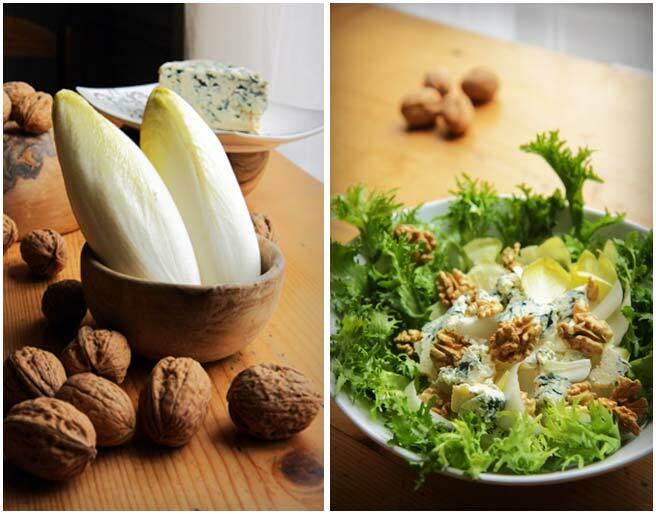 A raw endive salad with walnuts and blue cheese is a French classic. Sometimes I wonder if I crave this during winter months just for the blue cheese. But when the endives are just right like they are now, I feel the sweet crunch that flirts with bitter in my mouth, punctuated with chunks of salty bleu d'auvergne, the whole tied together with the astringent warmth of the walnuts. The completeness of the trinity is distilled to one note. It cannot be broken down to its elements. Prepare the walnut oil vinaigrette and put it into the bottom of a salad bowl. Clean the greens and place them in the bowl over the dressing. Remove the outer leaves from the endives if necessary, and chop them, transferring them to a colander and rinse. Taste a wedge with core, and decide whether to use them in the salad or not. (Endives these days have been bred of most of their core's bitterness, but freshness will also affect the flavor, verify and eliminate the cores if they seem too bitter.) Spin or pat them dry with a clean cloth before transferring them to a salad bowl over the greens. Layer the walnuts and blue cheese on top. Toss with the walnut vinaigrette and a generous grind of pepper at the table before serving. A classic , and utterely delicious treat . Your photos always make me want to rush straight out to the shops ! I love a salad with bleu cheese and nuts and have been eating one often--winter or not. I espeially love the Bresse bleu cheese for its delectable creaminess. Ahh, the simplicity of French salads! I will try this walnut vingaigrette to help get my daily dose of omega-3. Thank you. This looks fantastic! I've just come across your blog, and am really looking forward to finding more kitchen inspiration. I love any leafy chicory with blue cheese and walnuts. It's like dessert, and it's addictive. I just made your endive, walnut and roquefort salad and it was delicious. Thank you! Making this salad tonight to eat with grilled steaks and haricot vert. I added watercress to the salad and shallots to the dressing. We'll see how it works. Those are perfect additions. Thanks for letting me know that you were inspired by this combination! What a lovely recipe and gorgeous photos - really enjoying have just found your blog.